Assistant Directing is not a job I ever thought I would apply for, much less be hired for. My undergraduate degree is in English Literature and Linguistics from a small liberal arts college in rural Texas. Over the course of my MA I never took a directing module. Directing was something I always quite liked, if I was in a small company made up of my friends. It was never something I was hugely comfortable with, though, as I haven’t yet quite gained the confidence to have a voice of authority. Dramaturgy and Playwriting were what I threw myself into instead: playwriting being the thing I really wanted to do, but had never been able to push myself towards; dramaturgy being a newfound love, an exciting middle ground between creativity and academia that no one seemed able to define in concrete terms. That leads me to The Gate, and to The Human Voice. It was the first call for a job I had run across that used the word ‘dramaturgy’ in the ideal person specification. Although I hadn’t graduated from my MA yet, and was severely aware of my lack of directing experience, that word gave me enough confidence to put in the application. I didn’t know how important dramaturgical skills would actually be, but thought that it was worth the chance to have it on my CV and in my skillset in a professional way, under a theatre which produces work I believe in. Having now been in my AD role for a week, I am finding my footing and enjoying navigating the dynamics unique to working on a translation and adaptation. The necessity of a dramaturg on this project is becoming clearer as we explore how to play with the space between older adaptations and our own project. I have found myself in the lucky position of assisting a director who understands he is tackling a huge obstacle in translating this tale of human experience from a different time and language, and an actor who trusts us to help guide her tackle it as well. Throughout the week we have gotten through the script about three and a few half times. By that I mean we have read it through three times, and then gone back with a fine toothed comb to attempt translating things there are no words for in English, as well as sentiments that may not resonate with today’s politics. Hope, Love, Technology. These are the words we have tacked to the wall above the three day timeline of one woman’s experience. 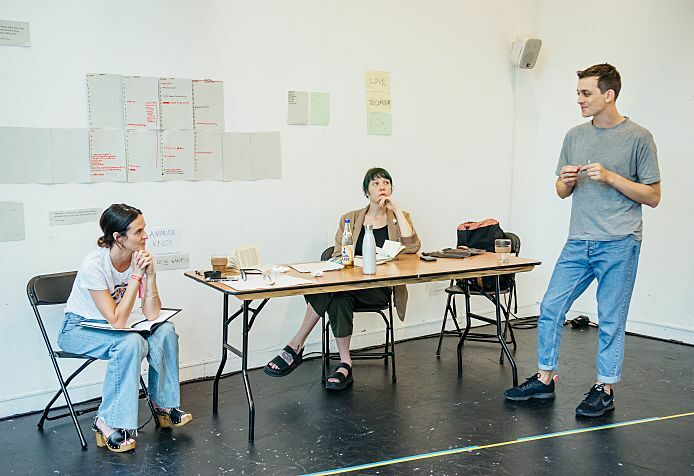 Three words, three days, one woman, one phone call, and four people in a rehearsal room to sift through the multiplicities those ideas contain in today’s Britain, and what they may have contained in Cocteau’s Paris. The gravity of these things makes sense of this company’s need to be malleable. In order to process all the ideas explored in this phone call, we must be able to explore as director, writer, actor, assistant, stage manager, designer, dramaturg, and most importantly as human. Book now for The Human Voice. From 13 September. Array (  => Array ( [id] => 212 [created] => 1535024400 [updated] => 1535024400 [ordering_count] => 203 [intro] => Assistant Director and Dramaturg, Jessi Clayton, shares how she got the role and gives us a peak into the rehearsal room. [title] => The Human Voice Rehearsal Diary: Week 1 [slug] => the-human-voice-rehearsal-diary-week-1 [category_id] => 0 [body] => Assistant Directing is not a job I ever thought I would apply for, much less be hired for. My undergraduate degree is in English Literature and Linguistics from a small liberal arts college in rural Texas. Over the course of my MA I never took a directing module. Directing was something I always quite liked, if I was in a small company made up of my friends. It was never something I was hugely comfortable with, though, as I haven’t yet quite gained the confidence to have a voice of authority. Dramaturgy and Playwriting were what I threw myself into instead: playwriting being the thing I really wanted to do, but had never been able to push myself towards; dramaturgy being a newfound love, an exciting middle ground between creativity and academia that no one seemed able to define in concrete terms.